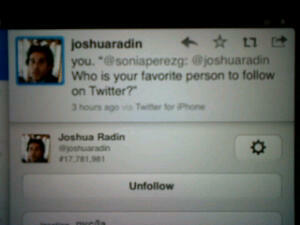 On today’s Be Jealous: Joshua Radin Edition, I’ve attached a picture below of Joshua Radin replying to my question I sent to him via Twitter. For those that do not know Joshua Radin, he’s this bomb indie musician. See? I’m his favorite person he follows on Twitter. He might find me entertaining because I’m a hot mess but nonetheless I’m his favorite. Be jealous. Word, Jen. Word. Grace, humor and pure hotness. What’s a girl not to be jealous of? Exactly. Be jealous.